Summary: Clay Jensen returns home from school to find a mysterious box with his name on it lying on his porch. Inside he discovers thirteen cassette tapes recorded by Hannah Baker, his classmate and crush who committed suicide two weeks earlier. Review: Thirteen Reasons Why is a novel that has had a lot of hype and talk over the last couple of years and somehow it never seemed to work its way to the top of my TBR pile. That is, until recently. 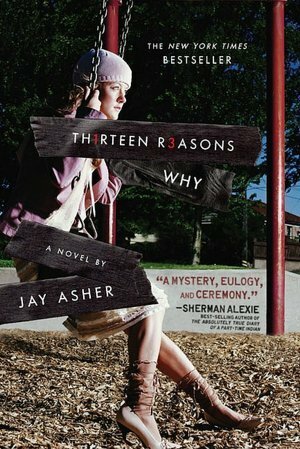 Jay Asher will be coming to a local Teen Book Festival on May 17th and I thought that finally I needed to read one of his novels. Touching, emotional, gut-wrenching and thought provoking contemporaries are one of my favorite genres to read. As much as I hate having mascara running down my cheeks, I love knowing that someone was able to write something real enough to affect me. That is precisely what Thirteen Reasons Why did. It is a contemporary novel written with dual narratives: first is Clay Jensen who is a high school student that returns home from school one day to find a mysterious package sitting on his porch. There is no return address and he is intrigued. Wouldn’t you be? Packages generally make me squeal with joy. Unfortunately, this was not the kind of package that one would look forward to or expect. Inside are thirteen cassettes that were recorded by Hannah Baker—the second narrator, a girl that Clay had a crush on; a girl who committed suicide just two weeks earlier. On her first tape Hannah explains what the cassettes are all about. That there are thirteen reasons that Hannah made the decision to end her life. If the tapes end up on your doorstep you are one of the reasons why. Clay tries mulling it over in his mind, thinking back to each and every interaction he has had with her. How is it possible that he is one of the reasons that Hannah ended her life? It has to be some kind of mistake. But it’s not. Along with the cassettes there is a map that Hannah put together of different locations throughout town which are important in her story. Over one evening Clay spends his time listening to the tapes that Hannah recorded before ending her life and he follows Hannah’s story across town. He listens to each of the stories knowing that each of these interactions led to her suicide. He tries desperately to figure out where he fits into the puzzle. Not each and every person was a saint but there were many people whose actions were not intentional. They were not all trying to hurt Hannah, to push her over the edge… which made me realize something. One small action, one simple interaction could easily do one of two things: push someone over the edge, talk them down from jumping. Maybe you don’t think that what you are doing is directly affecting someone, but it could be. Hannah was a prime example. And while many reviewers have said that her reasons for ending her life weren’t good enough I have to disagree. We are all different; we all think differently and process things differently. While something might feel as if it is no big deal to you, it may be the last straw for somebody else. And how would that feel knowing that you could have done something a little bit different and that someone might still be here? The best book I've ever read. is a must read for all depressed or suicidal teens, even my adult mother loved this and neither of us could put it down. I wish it was long i finished it in one day I just never put it down!